August 13 2010 - Cause of The Loss? August 21 2010 - M/V MSC Chitra - The Pheonix Shp - Back From The Dead? MV Khalijia-III was on approach to Mumbai, India. This story is about M/V MSC Chitra "On Mamba Departure". It was just before 10 am on a fairly clear day. Both ships with radar, GPS & Harbor Master instructions. As our resident Countryman & McDaniel vessel hull & machinery marine expert & litigator Geoff Gill, Esq. will explain in days to come -- the factor of human error has more influence on these situations than all the technology man might want to invent. Geoff Gill is a U.S. Mercantant Marine Academy graduate & licensed unlimited sailing Master who has fought the litigation which flows from collisions of this type throughout the world. It all -- of course -- boils down to our guiding code. "Ship Happens! ©"
MV Khalijia-III In Better Days. But This Vessel Is Now A Bit Shorter. This Could Be A Godsend To Salvors. M/V MSC Chitra has listed to 80 degrees and the total oil spill is nearly 50 tons", Arun Singh, Commandant (Operations), Indian Coast Guard said. Like The Wooden Blocks We Played With As Children. 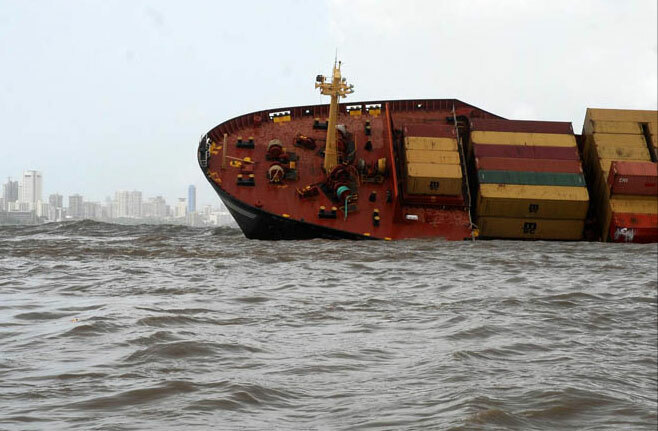 The Indian Government told salvagers to accelerate the removal of hundreds of containers ditched into the sea off Mumbai's coast as the nation's busiest cargo-box harbor remained closed for a third day. "This work has to be speeded up," Rakesh Srivastava, the joint secretary for ports at the Ministry of Shipping, said in an interview yesterday after a meeting to discuss recovery operations. Salvagers are retrieving four to six boxes a day of the 300 that are floating in the sea or submerged, he said. The containers must be removed by Aug. 14 to pave the way for the re-opening of Jawaharlal Nehru Port and the smaller Mumbai Port, which together handle about 40% t of India's exports, Srivastava said. The shutdown has disrupted deliveries of oil to a local refinery, hindered shipments of grains and forced container terminal operators to suspend export bookings. 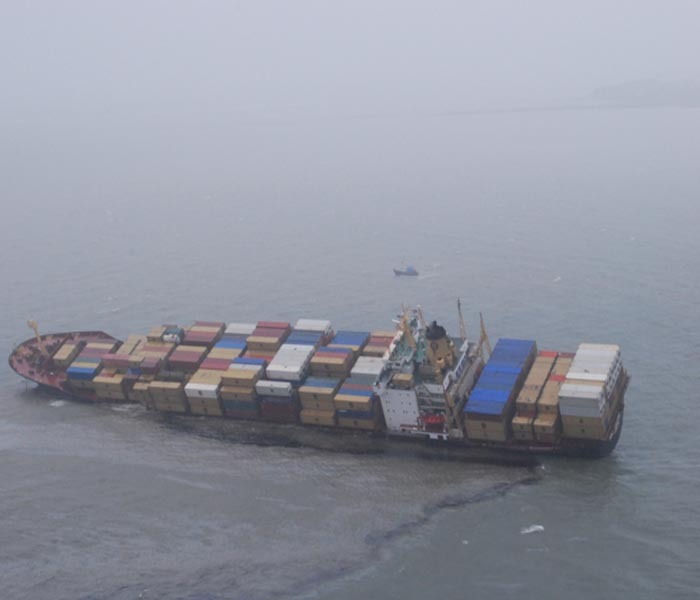 M/V MSC Chitra Might Be Salvaged, But None of Her Cargo. The Mumbai Sessions Court on Aug. 10 granted bail to Capt. Ranjit Martin of M/V MSC Chitra, the ship that collided with another Panamanian ship off Mumbai coast resulting in oil slick and large scale marine eco-pollution. Ranjit in his bail plea said the collision happened because of a navigational error caused by the failure of radio communication. He also argued that there was no error on his part and pointed out that he had been working in the industry for the last 18 years. 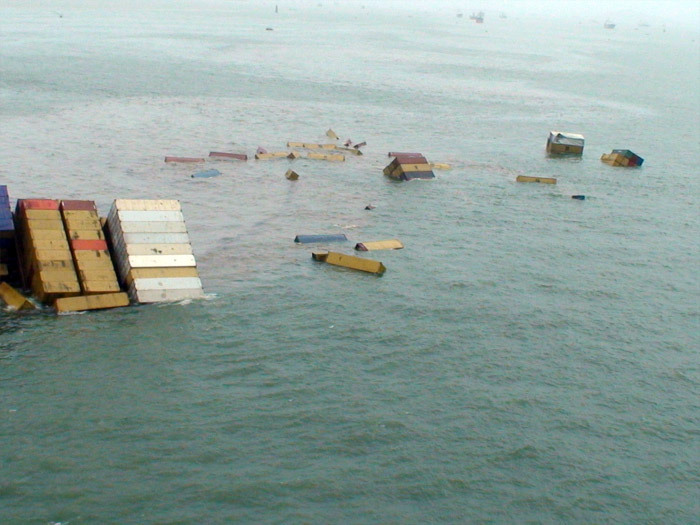 Meanwhile, a Singapore-based company would begin salvage operations. A crane mounted on a ship has been placed next to M/V MSC Chitra and preliminary clearing operations have begun. The plan is to remove the containers, pump out oil and then tow the ship to the shore. The Brihanmumbai Municipal Corporation (BMC) today began conducting random checks of seafood items in its markets to ensure that whether it is contamination-free. India's busiest container port resumed partial operations, ending a three-day shutdown caused by the ship collision that stranded about US$4B of exports. Jawaharlal Nehru Port let one ship through this morning and will allow vessels with a draft of up to nine meters to move during high tide, Chief Manager S.N. Maharana said in a phone interview. The adjacent Mumbai Port is also considering opening its channel after a meeting today, Chairman Rahul Asthana said. From The Cargo Letter - August 13 2010 - Cause of The Loss? 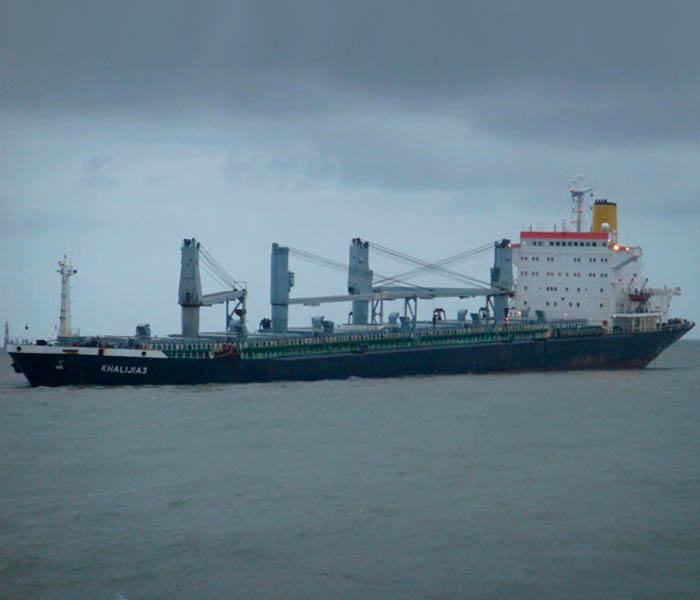 The Aug. 7 collision between two ships off the Mumbai coast was caused by a clear violation of standard operating procedure prescribed for communication between ships as well as with port traffic controllers. Sources at the Mumbai Port Trust (MbPT) told The Indian Express that similar violations had taken place several times in the past as well but had luckily not resulted in any damage. The Panama-registered M/V MSC Chitra collided with the St Kitts-registered M/V Khalijia III around 9.40 am on August 7 in clear weather. The Mumbai Port and the Jawaharlal Nehru Port have both been closed for operations since, as over 200 floating containers pose a navigational hazard for ships entering and leaving the channel. 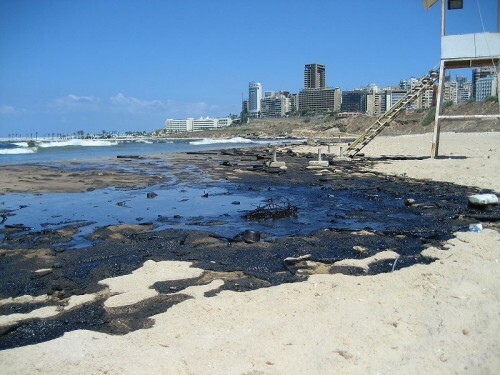 About 900 tons of oil that leaked out of M/V MSC Chitra has also polluted the waters and beaches in the area. The Director-General of Shipping subsequently said the two ships were operating on different frequencies, Chitra on VHF 13 as she departed from Jawaharlal Nehru Port Trust (JNPT), and Khalijia on VHF 12 as she was approaching MbPT. The Vehicle Traffic Management System (VTMS), operated from a building in the MbPT area, also operates on VHF 12. But sources said the communication gap arising out of the two ships operating on different radio frequencies is forbidden by navigational rules governing the piloting of ships in & out of the common channel shared by the two ports, among the country's busiest. "JNPT pilots know, and have been reminded often, that although JNPT operates on VHF 13, they must switch over to VHF 12 while passing the common channel shared by both ports," said a source. The preliminary probe by the police and port authorities has hinted that the captain of MV Khalijia 3 was more at fault than the captain of M/V MSC Chitra. The police had taken videos of both the ships and also done on-the-spot inspection and found that Captain Laxman Dubey was more at fault. NN Kumar, the JNPT chairman, said there was no reason for M/V Khailijia 3 to change its course and M/V MSC Chitra was following its own course. The captain of M/V MSC Chitra , Ranjit Martin Minguelinho has got anticipatory bail till August 18. The police has made it clear that though the offence has been registered against the captains and crew of both ships, they will soon decide whom to chargesheet. From The Cargo Letter - August 14 2010 - Cause of The Loss? 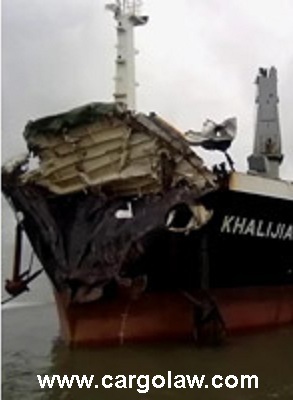 Officials of M/V MSC Chitra said that bulk-carrier MV Khalija III had flouted navigation rules that led to the collision between the two vessels off Mumbai's port, resulting in the oil spill. "From the data, it is apparent that M/V MSC Chitra was properly proceeding outbound, within the main navigation channel. Khalija III left its anchorage position and crossed the channel ahead of the M/V MSC Chitra at a distance of about 1.7 nautical miles. M/V MSC Chitra maintained her outbound course along the channel," said Captain N. Malhotra, spokesperson of the M/V MSC Chitra. "Khalija III, after crossing the channel, turned sharply to port and re-entered the channel. This was less than two minutes to collision. On re-entering, M/V Khalija III continued to port contrary to rules of navigation and its bow, the front section of the ship, struck MSC Chitra ahead of the mid-ship area," he added. Malhotra added that the Vessel Traffic Management System (VTMS), a marine traffic monitoring system set up by the Mumbai Port Trust, also failed to alert the ships on time. As a result of the oil spill from the containers that fell into the shipping channels, the operations at the Mumbai port and its neighbouring Jawaharlal Nehru Port have been closed. Malhotra said that the clean-up operations are underway and the remaining containers will be rescued once the vessel is stabilized. Port authorities have sent notices to the merchant vessel's owners, the Mediterranean Shipping Company, asking them to pay full compensation since they have been identified as "polluters". This compensation will run into crores of rupees. It was M/V MSC Chitra 's tanks that caused the oil spill and the falling tankers caused both Mumbai Port and Jawaharlal Nehru Port Trust (JNPT) to shut down. The two ports have also expressed unhappiness over the salvage work and have warned M/V MSC Chitra 's company to accelerate the process. So far both the ports haven't put any blame on MV Khalijia, the other ship, for footing the compensation. If investigations by DG Shipping show that M/V Khalija III was responsible, then MSC can claim it from Khalijia, but currently the "polluter" is MSC and it is hence liable to pay. 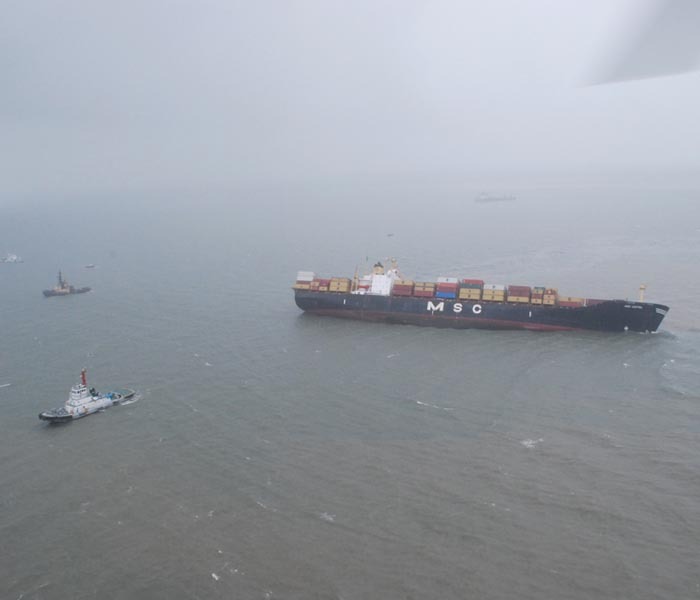 10 days after the collision, salvage experts finally have boarded the listing ship M/V MSC Chitra. So far, in the past 10 days, the Indian Navy has helped pilot out 63 ships and escorted in 71 ships. According to officials, in normal times, an average of around 35 large ships, besides scores of smaller vessels, use the main shipping channel daily. 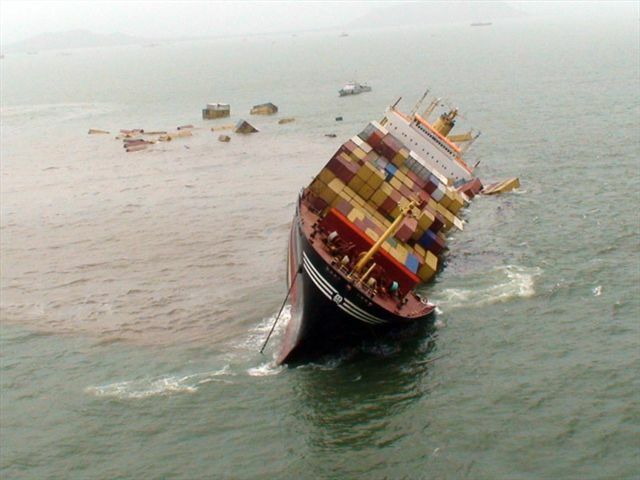 Meanwhile, nine more containers fell of the Panamanian ship,M/V MSC Chitra, which remains grounded. So far, the Navy and Coast Guard have succeeded in identifying six sunken containers near the main shipping channel and another eight floating at various other locations that have been marked to warn navigating vessels. Salvers from SMIT International, Singapore, have done a thorough check of the deck and hold areas before attempting operations like removing the remaining oil on board or stabilizing the ship. From The Cargo Letter - August 21 2010 - M/V MSC Chitra - The Pheonix Shp - Back From The Dead? 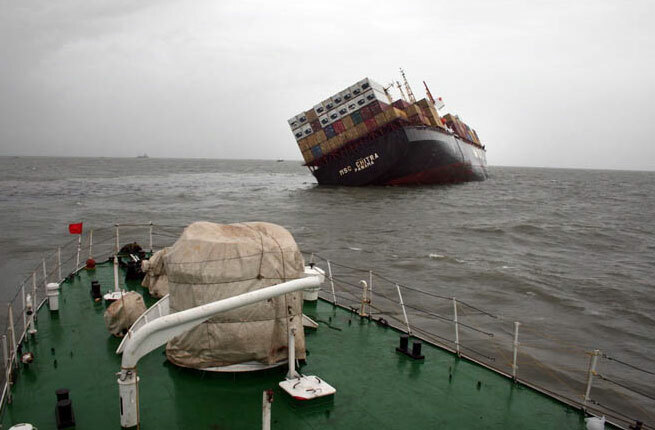 MSC Shipmanagement is confident it can save the 30-year-old, 2,314-teu ccontainer vessel M/V MSC Chitra, which was left foundering off Mumbai following a collision with a bulker that has led to shipping's third-largest oil spill this year. 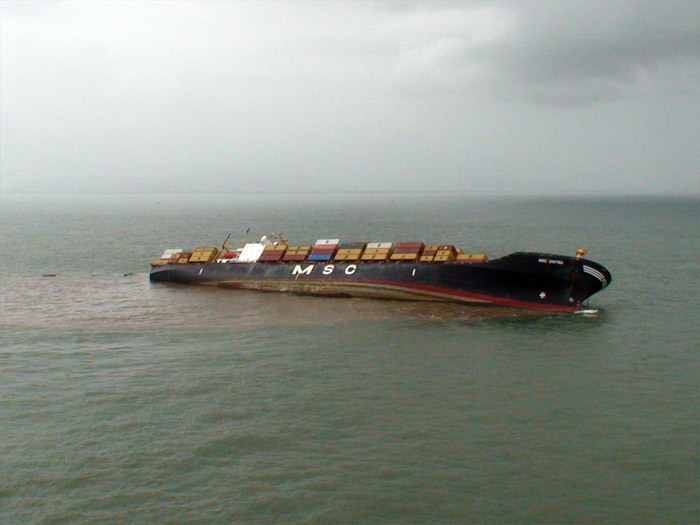 M/V MSC Chitra was left in a 45-degree list following the high-impact collision. A spokesperson for its Hong Kong-based manager says assessment is still underway and the extent of the damage to the hull has not been fully evaluated. But he expects the vessel could be righted from the list and saved to continue trading. Specialist salavage company Smit has been given the job, although it is unclear if it is on a Lloyd's Open Form (LOF) basis. The ongoing Indian monsoon could yet hamper salvage operations. The M/V MSC Chitra was hit on the port side by the 41,800-dwt bulker M/V Khalija III (built 1983) between its No 2 and No 3 cargo holds, piercing its fuel tanks. 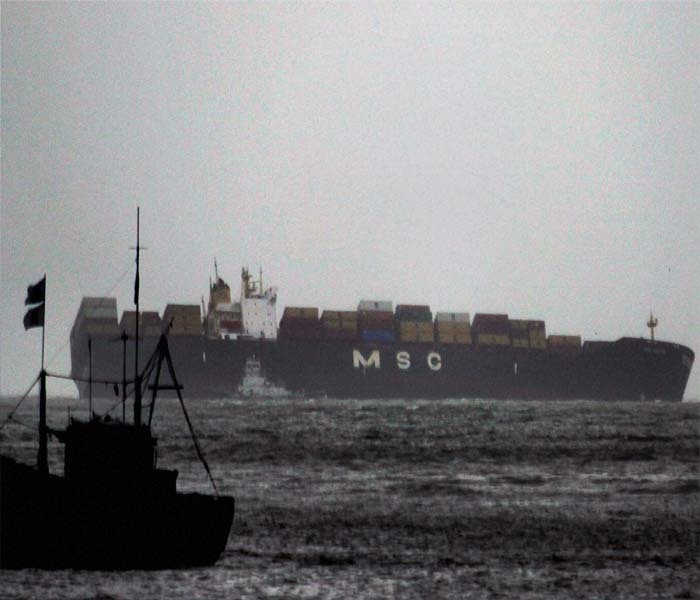 MSC said in a statement that evidence from the M/V MSC Chitra 's black box suggested that the M/V Khalija III was at fault. 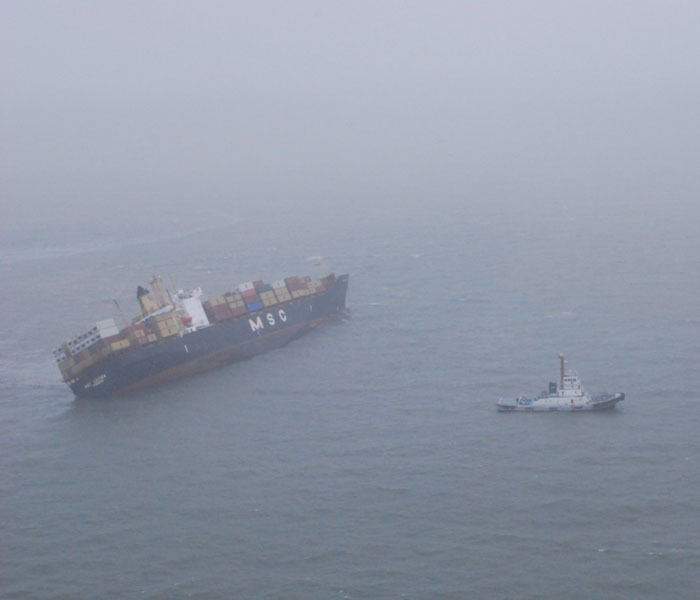 It claimed the bulker had "unexpectedly turned toward port" resulting in the collision. "It would appear that under the rules of navigation, the M/V Khalija III was significantly at error." MSC also says the bulker had been grounded for three weeks and was under the control of salvors when the accident happened. The M/V MSC Chitra was built in 1980, a long time before double-hull fuel tanks and other protective measures became mandatory for containerships under International Maritime Organisation (IMO) regulations. The spill threatens to be one of the largest this year. Although the company is playing down local reports of a massive 800-ton spill, estimates suggest it is well in excess of the 50 tons originally reported. The fuel leak was plugged and clean-up operations involved some 11 offshore vessels employed locally. Other major spills this year include some 1,400 tons lost from the 96,000-dwt M/V Eagle Otmoe (built 1994) after a collision at Port Arthur, Texas, and some 2,000 tons leaked from the 105,800-dwt M/V Bunga Kelana 3 (built 1998) following a collision off Singapore. 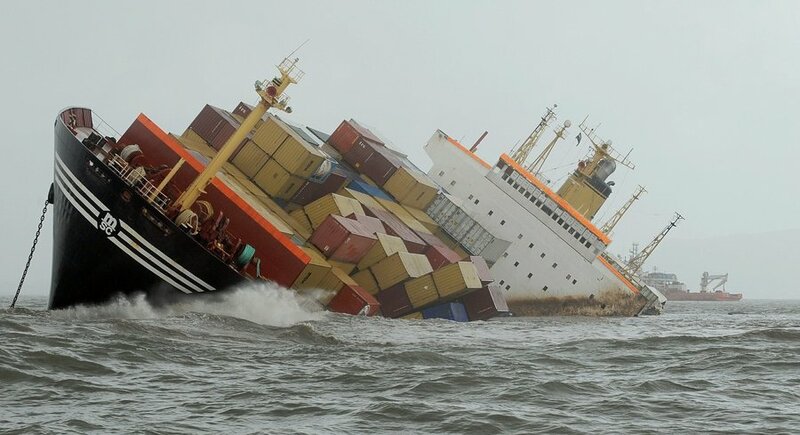 Two hundred containers out of 1,200 on board the M/V MSC Chitra have also been lost in the accident. Some of the cargo on board is thought to include pesticides and other hazardous chemicals, presenting a further danger to the environment. The ship had run foul of port-state control (PSC) in the Tokyo region, being detained twice in 2008 &emdash; once in Wellington, New Zealand, and then again in Freemantle, Australia, where a total of 60 deficiencies were found. It was routinely inspected in the Tokyo MOU region after that but no further deficiencies were picked up that warrented detention. However, M/V MSC Chitra is still ranked as "very high risk" under the Tokyo MOU. A barge has arrived from Dhabol port in Gujarat with equipment to start unloading containers from the deck of the beleagured Panamanian ship M/V MSC Chitra from Aug. 28, a maritime authority said Aug. 26. 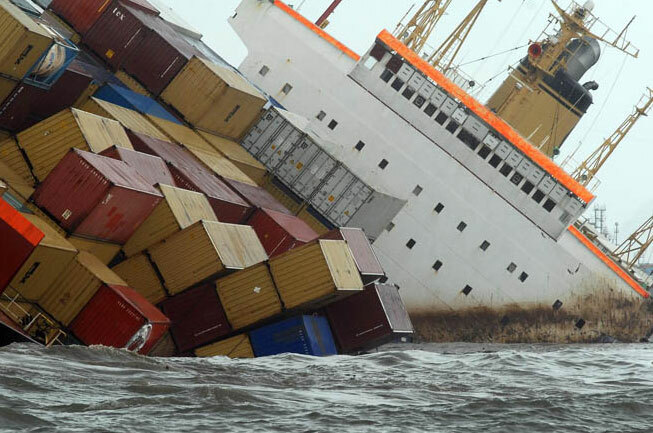 The containers continue to be on the deck of the ship in a precarious condition. The barge is being prepared with cranes and other equipment to position it near M/V MSC Chitra and start the work of unloading the deck of the containers. The ongoing survey of the navigation channel by the Indian Navy has also revealed eight sunken containers, of which one is in the main channel. It has been marked and the concerned authorities have been advised to issue suitable navigational warnings to vessels sailing in the area. The Navy has also completed the first round of survey of half of all accessible port waters, around 75 square kms, after the ship collision. Aug 23: Government hopes to clear the channel and make the sea navigable. Aug 31: Directorate General Shipping to give its inquiry report. An inquiry into the collisionseems to indicate that MV Khalijia III was at fault for violating navigational rules. The Directorate General of Shipping has concluded its investigation and is likely to submit its report in 10 days, a senior police officer who did not wish to be named told The Hindu newspaper. "Khalijia flouted two basis rules. No ship will enter the channel that small unless it is clear. Secondly, even if it enters, it does so at a less threatening degree. This is categorised as a blunder," the official said. So far, agencies have sent notices for claims to M/V MSC Chitra, as it is the polluting vessel. If Khalijia is found to be at fault, Chitra would be transferring the claims to Khalijia. Capt.D.K. Tewari of MSC Agency (India) talks about the collision and legal action his company plans to take. At least 189 containers that were on board M/V MSC Chitra are missing, eight of which contain hazardous material. 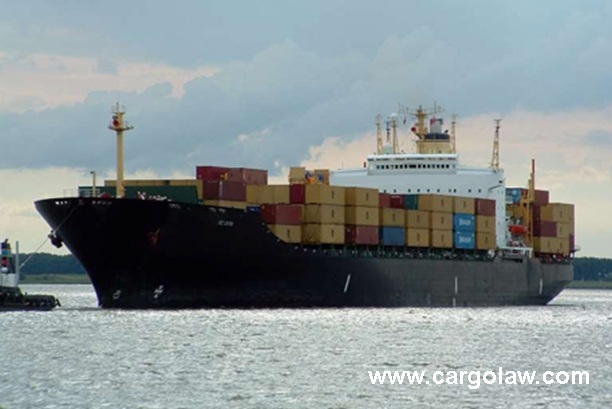 Of the eight containers, six had solid sodium hydroxide, one had organic pesticides and one had aluminum phosphate tablets, said the Mediterranean Shipping Company (MSC). 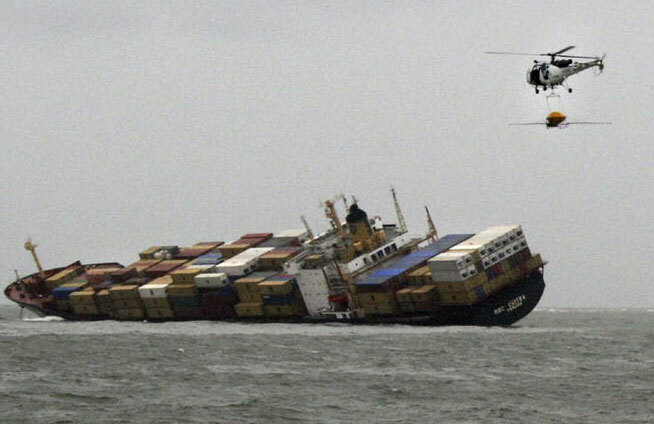 "These containers have gone overboard and are missing," said Captain Deepak Tiwari from MSC. 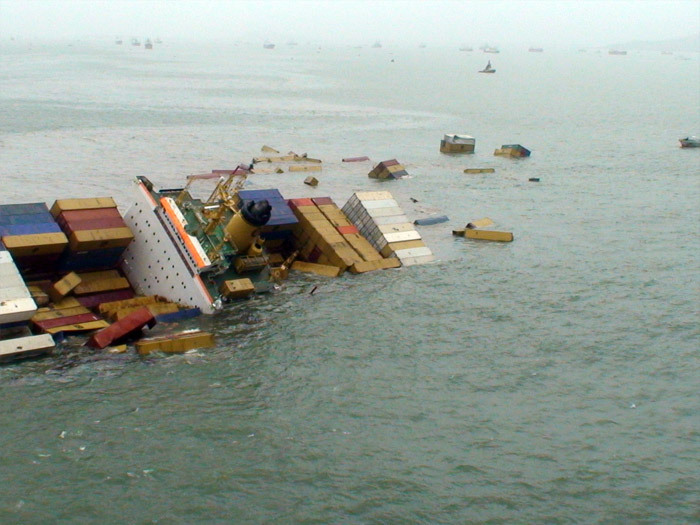 Officials from the Directorate General of Shipping (DGS) said a team of specialised divers has been called to search for these missing containers, which may have sunk to the seabed and may be covered with a layer of sediment. "None of these containers are in the main navigation channel so they do not affect port operations. They may be close to the vessel," a DGS source said. M/V MSC Chitra was carrying 531 containers, of which 31 contained hazardous materials, and 3,300 tons of oil when the collision took place. To date, 111 containers have been removed and there are more than 200 containers still on the deck. Operations are on to lift the containers off the ship, and it will take at least one month to retrieve all of them. Tiwari said the company has spent more than Rs 45 crore on clean-up operations along the state's coastline. 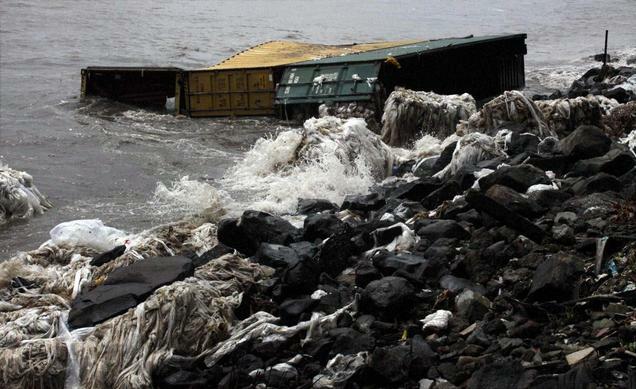 MSC officials also said they have paid Rs 1 crore as advance to the Maharashtra Pollution Control Board (MPCB) for the initial clean-up operations and have to pay another Rs 2 crore. Tiwari said the state environment department has directed them not to undertake clean-up operations of the damaged mangrove sites. "The roots of the mangroves are not affected so they should be left alone so they can rejuvenate naturally. Carrying out cleaning operations will only damage them further," said an MPCB official. Tiwari said MSC is awaiting the DGS report after which it will decide what action needs to be taken against the owners of M/V Khalijia-III. million (ppm) to 20 ppm of phosphine gas since M/V MSC Chitra the collisionoff the Mumbai coast on August 7. Prior to this, the phosphine level emissions noted have been between 0.1 ppm and 9.0 ppm across the deck of M/V MSC Chitra. MPCB officials said there is no permissible limit on how much of this gas emission is acceptable because under normal circumstances, there should be no trace of this gas. Officials said that a larger quantity of the toxic gas, which is both odourless and colourless, has been leaking for some time now, but the levels recorded on Sept. 17 are alarming. "Of the six holds, phoshine gas between 2 ppm and 20 ppm is being emitted from hold number 2 and number 4," said an MPCB official, requesting anonymity. Phosphine levels between 0.05 ppm and 2 ppm have also been noted on the crane barge, Kuber, which has been positioned near M/V MSC Chitra to help assist in the salvage operations. Senior officials from the DGS said the source of the gas could be the containers that have aluminium phosphide, which when mixed with water releases phosphine gas and aluminum hydroxide. "This gas will hamper salvage operations as until the gas emission stops completely, the containers in the hold cannot be removed," said a DGS official. B.D. Wadde, regional officer, MPCB, said the gas is extremely toxic and if inhaled can lead to severe health hazards. Overexposure to phosphine gas can lead to nausea, vomiting, abdominal pain, diarrhoea, chest tightness and breathing difficulty. "But the salvers who are carrying out the operations are well-equipped with masks and other gear so it will not affect operations," he said. We plan to stay with this sad story, as the history of M/V MSC Chitra winds down. The Dedication of This Feature Is Simple: To The Crew of MV MSC Chintra & her familes.